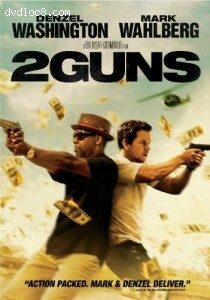 Synopsis: Academy Award winner Denzel Washington and Mark Wahlberg lead an all-star cast in the explosive action hit 2 Guns. When an attempt to take down a drug cartel blows up in their faces, two undercover operatives are forced to go on the run together, though neither knows that the other is a federal agent. Suddenly, everyone on both sides of the law wants them dead, and their only hope is to trust each other. Filled with non-stop action and suspense, critics are raving "Washington and Wahlberg are at their very best."